4 October 2010: Rarely does a city make a name for itself by furnishing to other cities bike systems manufactured by the municipal government, but that’s exactly what Montréal has done with its Public Bike System Company, also known as Bixi bike share. 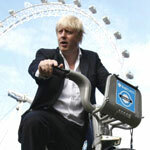 Now that the service is well-established in its place of origin, the city has been exporting its bikes prodigiously: last August, it secured major contracts with London and Boston, each of which have received thousands of bikes and several hundred bike stations this summer. The United States arrives relatively late to the bike-share game, which began with the 2005 opening of the Vélo Libre (Vélib) network in Lyon, France and exploded once Paris and Barcelona opened their systems in 2007, each featuring thousands of bikes. Modern bike sharing necessitates advanced information technology not available until recently and relies on small automated stations with 5 to 20 bikes situated every few blocks throughout city centers, smart cards, and sturdy bikes. Those first few systems were funded through ad revenue from outdoor signs and are operated by private companies like JC Decaux. They were successful in increasing bike market share by encouraging people to use bikes, rather than cars, for short trips. 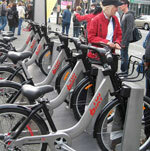 The result is exciting: Bixi offers a better bike and a more reliable system. As someone who relies on bike sharing virtually every day, I can appreciate that: the bikes in Paris are convenient, but their design is clumsy enough to allow thieves to break off parts and evenwith a little worksteal them whole from their stations. They are also often difficult to enter into and remove from station docks because of unevenness of streets. Bixi could become Montréal’s best known export and bring with it an increased interest in what is a fascinating metropolis. Indeed, the Ville-Marie has recently been promoting its broad artistic offerings as a UNESCO “City of Design.” The genuine local ingenuity that produced Bixi and could be spread into other domains if the civic culture that encouraged its creation were advanced into larger spheres of thinking. Who says Montréal’s innovative new bus shelter or recyclables collection tool shouldn’t be sold elsewhere as well? For now, though, Montréal’s primary exports will apparently be in the field of bikes alone. Minneapolis will be getting an ambitious network  and it seems likely to attract a large number of riders, since it will include 80 stations and 1,000 bikes, enough to encourage a large percentage of the inner city’s population onto Bixi by the time it opens for service. The system is being pushed by a local non-profit called Nice Ride Minnesota, which received federal grants and a large contribution from Blue Cross Blue Shield to fund the system. If the Minneapolis system is reliable and popular, interest in Bixi seems likely to spread; New York City and Portland are already expressing interest in their own networks of the Canadian bikes. It’s a unique but seemingly effective way to advance Montréal’s civic brand  and makes you wonder how else the city could use its municipal resources to change the way we think about living in the urban environment. With more motor vehicles, roads, and parking lots than any nation on earth, the United States is renowned as the land of the automobile. Many cities have more registered automobiles than residents. The monthly car payment for American families often exceeds its mortgage payment. But in spite of America’s love affair with the car, many US mayors are now striving to make their cities more bicycle-friendly.